This appendix describes the following configurations using CSP on a remote web server. In the Setup Type dialog box, select Web Server and select Next. Review the installation name, type, and destination directory and, if correct, select Install. This creates the CSP directory structure on Machine W and creates virtual directory references for the /CSP and /CSP/Bin files. (Bookmarking this URI is helpful). This link is for your external web server, not the Private Web Server supplied with Caché. Select Server Access in the left-hand menu. The Caché installation configures a LOCAL server to connect to the Caché instance on the local machine, Machine W.
Enter a name for the server (Machine C for example). Enter the TCP/IP Address and TCP/IP Port of the remote Caché server on Machine C.
Modify the Connection Security settings to match the level of authentication expected by Machine C for CSP Gateway connections. See the CSP Gateway and Security section in this guide for details. Select Application Access in the left-hand menu to associate the path to the CSP application on the remote Caché server, Machine C, with the server configuration previously created for Machine C. The default paths are predefined for / and /csp. Create a new application path to represent the CSP application running on the remote machine, Machine C. You can either copy an existing configuration (such as /csp) or select Add Application to manually create a new path configuration. The path you create for the application must match that defined for the application in the Caché instance on Machine C.
For example, the default path to the Management Portal is /csp/sys. If you are creating a new application choose your own path name. For example: /myapp or /csp/myapp. Having created the new path, modify the Default Server parameter for the path such that it takes the value of the Caché server configuration that you previously set up for Machine C.
Finally, save the new path configuration. If you are planning to serve static files from the web server, create directories on Machine W to represent your application path. These directories exist solely to hold static content such as image files. You do not have to place any CSP files here; they reside on Machine C.
Under the directory install-dir\CSP on Machine W, create \Samples and \User directories. Also create directories to represent other paths which may contain static components referenced in CSP pages. The example in the previous section, requires you to create a directory for \myapp. The application path configuration for /csp/newapp is used if it exists. If not, the configuration defined for /csp is used instead. The CSP Gateway installation procedures configure the hosting web server to recognize the /csp virtual path. Typically, these same settings also apply to directories placed under /csp (/csp/myapp, for example). The installation procedure for the CSP Gateway configures the virtual directory /csp for CSP applications. If all of your applications are under this virtual directory (for example, /csp/myapp) and you are not using virtual hosts, you do not need to add virtual directories. The instructions in this section apply specifically to the IIS (Internet Information Services) versions 6 and 7 web server. 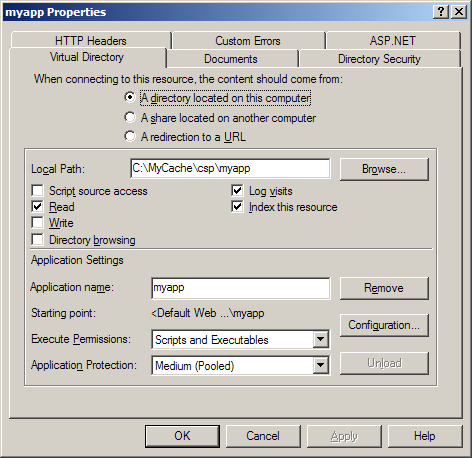 Set up the application path resembling /myapp in the previous examples with properties similar to the /csp virtual directory which is automatically created for you during the CSP Gateway installation. Navigate to the Internet Information Services management dialog box, which is likely accessible from the Administrative Tools menu of the Windows Control Panel. Expand the folders and right-click Default Web Site. Either select Save and Apply all changes, or if you are using the wizard, select Finish. Restart IIS to apply the changes. If you are using an Apache web server to control a remote Caché server and your application path is altered from the /csp default, you must manually add a corresponding alias to the Apache configuration file pointing to the local CSP directory. Read this section if you need to configure a single web server to access a single CSP application on more than one Caché server. Also read this section if you want to use a single web server to access more than one CSP application on more than one remote Caché server. This section uses the Management Portal as the example application. Adapt these procedures for your own CSP application. Once you have configured your application as described below, then to access this application on different servers, such as servers called cache1 and cache2,you will include the individual Caché servers names as part of the URLs as follows. You can choose to display the Caché server name in the application path URL or not. If you are content with using the Caché server name in the URL, skip this subsection and proceed to the next subsection called Configuring the Caché Server for the Application Path. If you do not want the Caché server name displayed in the CSP application URL, then follow the procedure in this subsection to create a substitute name. Use the CSPConfigName parameter of the %System.CSP.SetConfig method for each of these servers. This example uses linda as the substitute name for server cache1 and perry as the substitute name for a server cache2. Follow this example using your own servers and substitute names. Select Server Access. Add server configurations for cache1 and cache2. See the section Configuring Server Access for details. Select Application Access. Create an application path /linda/csp/sys/ with a Default Server of cache1. Create an application path /perry/csp/sys/ with a Default Server of cache2. See the section Configuring Application Access for details. If the web server is IIS then set up virtual directories for /cache1 and /cache2 as described in the Add Virtual Directories to IIS section. If using an Apache web server see Add Aliases to Apache Configurations. Select Application Access. Create an application path /cache1/csp/sys/ with a Default Server of cache1. Create an application path /cache2/csp/sys/ with a Default Server of cache2. See the section Configuring Application Access for details. Both virtual_host1 and virtual_host2 are served by the same web server and CSP Gateway. Select Server Access to create a server configuration for cache1 and cache2. Select Application Access to create the application paths //virtual_host1/csp/sys/ and //virtual_host2/csp/sys/. Note the use of the double forward-slash (//) to introduce the virtual host name. Set the Default Server for path //virtual_host1/csp/sys/ to be the name of the server configuration set up for cache1 in the previous step. Set the Default Server for path //virtual_host2/csp/sys/ to be the name of the server configuration set up for cache2 in the previous step. No changes are required in the configuration of the two remote Caché servers. The application path for the portal remains as /csp/sys/ in both cases. See Virtual Hosts Overview for more information. Virtual hosts are a means through which you can transparently serve applications on one or more instances through a common web server. Each server installation appears to operate as a separate web server. Regardless of which way you choose, set up a named slot for each Caché installation in the CSP Gateway configuration (it does not need to be the same as the Caché instance name). The superserver port that the CSP Gateway configuration (for each server) is pointing to is what is important. Both are served by a single web server installation. You can implement servers including mixtures of all three. Options 1 and 3 are identical from the browser perspective. You can configure each virtual host to have its own documents root, etc. To extend the virtual host concept through to CSP, suppose you wish to run the same CSP application through two virtual hosts, but on different Caché instances. For example, one site for testing and another for production. The Gateway allows you to extend this configuration to include the name of a virtual host through which you access the application. You can then configure a separate Caché server for www.serverA.com/csp and www.serverB.com/csp as shown above. Introduce server names by //, as shown. The servers specified in the CSP Gateway configuration do not necessarily have to be virtual. For example, you can configure a single NSD installation to support several real Apache installations with a different set of Caché servers defined for each one. Further, you can configure each Apache server to support many virtual hosts. The CSP Gateway identifies the host for the application through the CGI environment variable SERVER_NAME.